Not exactly portable, but a great performance synth with the best analogue emulations around. Superb analogue synth emulation. Large ribbon controller. Seemingly limitless modular combinations. 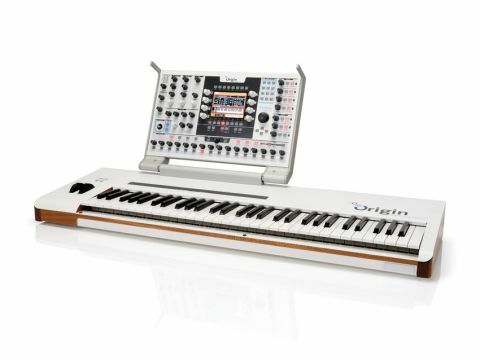 The Origin hooked up to a keyboard forms a new performance heavyweight. The LCD screen offers feedback for your editing - but sadly it's not touchscreen. The foldable panel is mounted on incredibly stiff hinges, so it won't bend or move during tweaking. The Arturia software synthesizer emulations have become classics in their own right. In 2008, the company rolled the essential elements of these emulations into a single unit: the Origin. Grafting it onto a keyboard has taken almost two years and added 15kg along with five octaves of keys, pitch and mod wheels and a ribbon controller. The Origin firmware has also undergone a series of updates over this time, further expanding the performance and programming capabilities. Though these capabilities remain ostensibly the same the emphasis has shifted from a mainly studio-based tool to a complete synth performance solution. "You can treat any external source to the filters and effects just like an oscillator and it sounds amazing." The most noticeable aspect of the Origin keyboard is the weight, which at 23kg is considerable. It needs a sturdy keyboard stand and sizeable flight case to take the extra height provided by the fold out control panel/synth brain. This does, however, lend it a professional feel that it well deserves, though a couple of design elements detract slightly. Firstly the keys aren't weighted as we would expect from a keyboard of this price and calibre, though they aren't the flimsy type either. Secondly it draws its current from a 6.5v external PSU which is an odd value that cannot be easily/quickly replaced - a standard IEC cable and internal PSU would be so much better. Despite these two grumbles the build quality is excellent throughout. The pitch and mod wheels on the keyboard surface are sturdy while the large ribbon controller is gratifyingly sensitive, allowing the user to indulge in a more complete CS-80 emulation experience. Grumbles about weighting aside the keys are responsive with plenty of travel for the aftertouch. The velocity scaling is fully user configurable and the aftertouch has a 'duophonic' function wherein control can be set to only affect the key in question allowing individual note pitch modulation, for instance. There are easily enough controllers on board for most performance needs, from the joystick to the four possible key mapping splits. In programming and performance, the Origin Keyboard is surprisingly easy to work with and the tilting display/control surface allows for a range of working heights (for the stand and the user). It seems easier to use than the rack/desktop unit because the issue of mounting it by the controller keyboard is already solved. The screen, as with all the controls, remains unchanged and will still challenge those who have neglected the opticians! There are frankly too many controls to list in any detail here, but suffice to say the sheer depth of synthesis available is very well catered for by the inputs to hand. The essential operating system is biased towards the jog wheel and cursors but there are a whole host of dedicated knobs and switches to prevent the menu-page-based editing becoming too frustrating - short cuts soon become second nature. A criticism levelled at the Origin desktop unit is that the oscillator, filter, LFO and envelope controls are singular and thus separate hands on control of, for instance, two filter cutoffs cannot be instantly achieved. These knobs are designed as 'macro' controls which allow simultaneous alteration of the same parameter in any combination of elements within a Program, e.g. the attack time of some or all of the ADSR envelopes. This makes for a useful performance control, the effect of which can be set to absolute or relative values across the assigned elements. These macro assignments are accessed via the Live menu screen which also features joystick control assignment, MIDI mapping and an overall view of the performance controls. This overview shows the assignments for the eight live encoders that flank the LCD screen which are easily assigned to any single parameter and thus help overcome the single control issues for filter and envelope adjustment. The Origin takes some getting used to and one cannot expect instant familiarity, but with time the programming and performance fluency grows. The initial shock of the comprehensive control layout and menu system soon subsides as the operating system is logical and intuitive enough to make programming relatively simple - it's only the sheer depth of possibility that creates a sense of complexity. The potentially fiddly Sequencer section has a long set of 16 input step value knobs and associated parameter controls. Editing sequences (up to 32 steps and three per Program) is quick and easy thanks to the control layout, so much so that editing on the fly is easily achievable making performance a whole load more fun. The Origin has two modes for synthesis: the single Program mode and the Multi mode. Both have dedicated menu access buttons beneath the LCD screen which bring up a series of tabbed pages for getting to the essential programming and tweakery. The sheer depth of synthesis available does mean that unknitting a preset can be lengthy work for the newcomer, and creating from scratch can be time consuming, but familiarity is key and patience is definitely rewarded. With good single Programs, (there are plenty in the factory settings and many more can be downloaded) the next step, especially to use the Origin as a performance instrument, is to create and edit Multis. A Multi has four Program slots each of which corresponds to the four Mixer channels controlled at the right of the main interface. These slots can be played from any of the four possible keyboard splits, each with independently assignable note and controller MIDI channels. The four slots are also available independently via the eight auxiliary audio outputs at the rear of the keyboard. The essential synthesis structure of a Program comes in two forms: the modular and the Minimoog template. The latter provides the user with the familiar form of the Minimoog on the Edit screen. This is currently the only complete emulation available as a template as it's the simplest (not sure a full CS-80 could be condensed into one Edit screen!). The modular patch form is a little more complex, though it only occupies two Edit screen tabs (Rack and Patch). The Rack displays the 24 module slots that can be filled with a range of emulated synthesis building blocks (oscillators, filters, mixers, etc). These can be selected and edited either via the dedicated control knobs (oscillator, envelope, etc.) or with the jog wheel/cursor combo. Modules can easily be added, removed or changed for a different model (e.g. from a CS-80 filter to a Jupiter-8 version). The Patch screen displays the modules in 'wired' form to highlight the interconnections (colour coded by connection type) and allows the user to isolate modules and their routings. In among the classic synthesis control sources (LFOs, envelopes, etc.) are two unique functions that can really add real spice to even the simplest of Programs. The Galaxy module combines three LFOs to produce complex modulations to two multi-destination outputs (X and Y). The output of two LFOs (A and B) are plotted as coordinates on a two dimensional plane which are further modulated by a third LFO (Phi), which itself can be skewed with relation to the X-Y plane. The result is a constantly evolving modulator that can drive sequences wild. The 2D Envelope is a looped multistage modulator with four separate outputs (A to D) arranged around a circle (N, S, E & W). Within the circle are five linked points that can be placed anywhere via the joystick. The 'modulation' loops between these points continuously (based on a specific input source) over user-defined time periods (up to 13.6 seconds) and thus passes the 'modulation' between the four outputs according to their relativity to the five loop points. The overall loop time can be shifted by a multiplier too and thus produce some very slow (r)evolutions, with the results being rich non-linear modulations. The levels of the main stereo output and the eight auxiliary outputs are healthy but not overpowering so that the headroom needed for highly resonant filter settings, for instance, do not distort either the Origin amps or the proceeding line amp/mixer. The audio input (yes, you can treat any external source to the filters and effects just like an oscillator, and yes, it sounds amazing!) has plenty of gain available for most sources. The S/PDIF output cannot be externally clocked, so the recipient device must be able to act as clock slave. On the subject of sound, it must be said that the Origin keyboard is awesome and as good an emulation of classic analogue synths as you will find right now. The TAE (True Analog Emulation) algorithm keeps the digitally created sound convincingly analogue and the amount of instability or 'thickness' can be altered in each Program via the TAE control. As a digital hardware synthesizer the Origin keyboard is in a field of its own, possessed of a truly pleasing sound quality coupled with a high degree of tweakability. The keyboard may not be of the fully weighted variety, but then nor were most of the synths it's emulating. The mounting of the Origin on to the keyboard section does make it portable, but the weight and odd shape will necessitate a specific flight case. One could get a decent controller keyboard for less than the £600 price difference from the desktop Origin, but the positioning of the hinged mount make it more convenient for performance and programming. As for the price, the original Origin is definitely not cheap either and this is no wonder considering the range and quality of analogue synthesis emulation and build that's provided, and so the same is true of this new keyboard version. This is a fantastic and rewarding instrument with a sound that is unrivalled in the emulation stakes - just don't skimp on the flight case.